I just returned from a business trip in the Dominican Republic meeting with the owners of the Aguayo Cement Tile Factory. Aguayo Cement Tiles are well known for their quality, large color palette, and commitment to new design. I've included Aguayo Cement Tiles in Avente Tile's line of hand-crafted tiles since I started the company more than a decade ago. Cuban Tiles from the Aguayo Cement Tile Factory. The trip was a great opportunity to discuss new product lines, manufacturing process improvements, and the ways Avente and Aguayo can work together to improve upon the service we offer to you, our customer. Although I had visited the factory and installations in this wonderful Caribbean island of Hispaniola before, each visit has always been filled with surprises, thanks to my very gracious host, Jorge Aguayo and his family. The Aguayo's have been making cement tiles for three generations. Their dedication shows by way of a top-notch manufacturing facility, their tile quality, and their passion for making each tile right. They always go out of their way to not only welcome me to the factory, but also into their family, as well as all that this island has to offer. It's through Jorge's kindness and warmth that allows me to share both the inner workings of a cement tile factory, and bring well-deserved attention to the hands that touch each and every tile. First, thank you, Jorge, for sharing so much about cement tile with me and allowing me to photograph and share what three generations have labored to create. 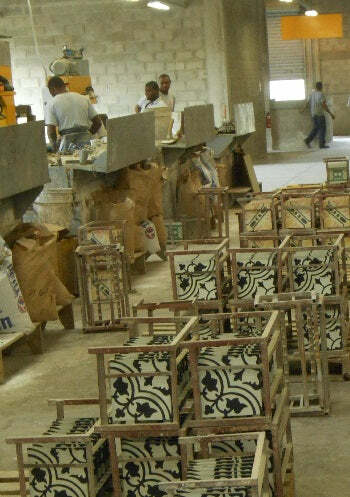 I hope you enjoy this tour of the Aguayo Cement Tile Factory. You'll walk away with a better appreciation and understanding of why handmade cement tile is truly a labor of love. The calcium carbonate in these bins will first be weighed, and then mixed to form the color layer of cement tile. Mineral pigments (such as iron, cobalt and chromium oxides). Mineral pigments are mixed to make the 90 colors available. The color layer is prepared in batches and every component is weighed in order to achieve color consistency. The color is mixed in a horizontal mixer that guarantees the homogenization of the mixture. The large ball (shown below) is used to help achieve these manufacturing requirements. The color layer materials are mixed in the horizontal mixer. For small batches, strike-offs, and samples, only a small amount of color is mixed in a bucket and blended with a "hand mixer." Patterned tiles are created using a mold that follows the lines of the pattern. 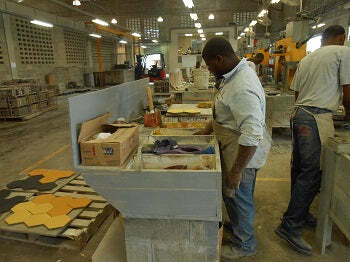 A cement tile mold is being worked on and checked against a pattern. Here's the cement tile mold library where molds are housed for existing patterns. If you want a new pattern or pattern in a different size, then a custom mold will need to be created. Avente Tile owner Bill Buyok (foreground), looks at some of the Aguayo cement tile molds. 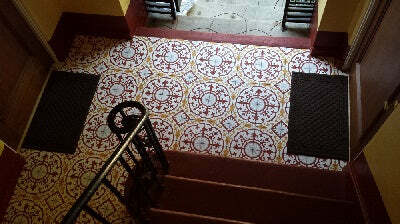 Each station is manned and operated by an expert cement tile maker and a mi ayudante, or my helper, in Spanish. The helper allows the expert tile maker to focus on getting the right colors in the mold slots, keeps the liquid cement tile bins full, and makes sure there is plenty of sand for the second and third layer. Without a helper, the time to make a tile would more than double. Each expert cement tile maker has an assist. The color is then mixed with water in mixing bins located at each station. 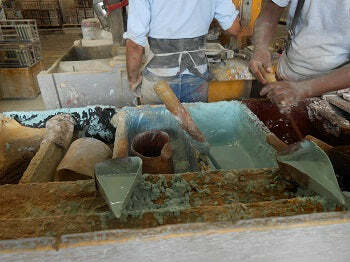 Color is mixed with water at the tile maker's stations. 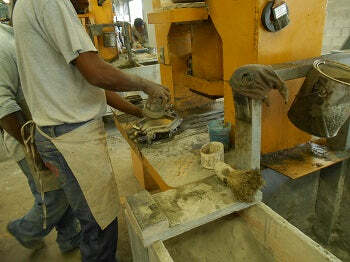 The colored cement is hand-poured into the different sections of the molds. The thickness of the color layer will always be between 3-5 millimeters. 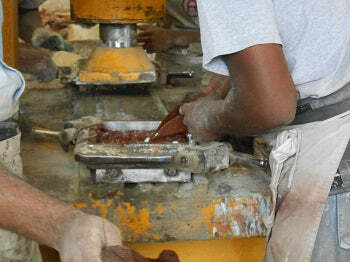 The colored cement is hand-poured into the different sections of the molds. Two layers of cement and sand are poured on top of the color layer to not only add strength, but also to absorb water from the color layer. Two layers of cement and sand are poured on top of the color layer. 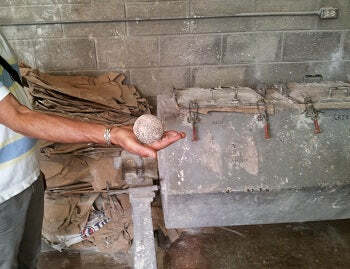 Finally, the cement tile is pressed using a hydraulic press, which applies 1,700 PSI of pressure. The tiles are then placed on racks as they come off the line. The cement tiles are placed on racks as they come off the line. The following day, the cement tiles are soaked in water in order to achieve water saturation and hardness. The water bath guarantees proper cement hydration. 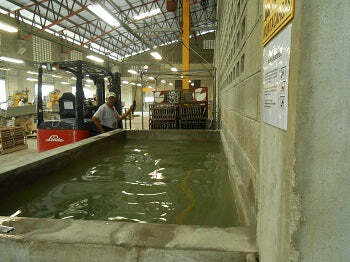 Racked cement tile are lowered into this water bath. The tiles are left to dry for 10 days and then hand-inspected. After 28 days from start of manufacturing, the cement tile's color surface will have obtained 98% of its hardness and is usually ready to be installed. It takes about two weeks for the tiles to arrive in Miami after they leave the port of Santo Domingo, including about one week for customs. 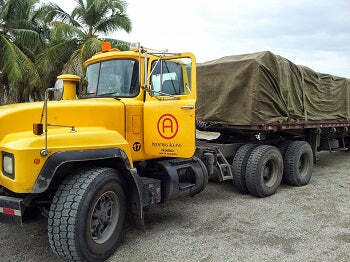 Tiles leaving the factory on an Aguayo truck for the Port of Santo Domingo. I hope you enjoyed the Aguayo Cement Tile Factory tour. You can see why making these tiles takes at least six to eight weeks for manufacturing and delivery. 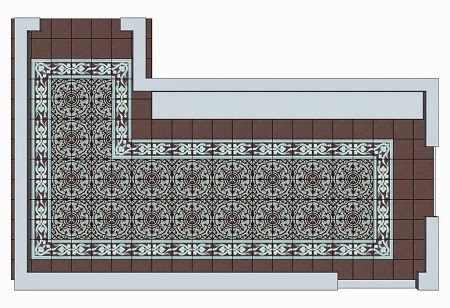 Now that you have an appreciation for the process, let us know what Aguayo Cement Tile pattern and colors you'll be using for your next project. We've made it easy for you! Just stop by our Avente Tile 's Aguayo Cement Tile Information Center! Cement Tile Designs That Impress! There are only so many materials where imagination and creativity are not only welcomed, but are highly encouraged. One of these materials is tile. For this post, I’d like to focus on cement tile specifically. Alcala cement tile in a custom colorway. Cement tiles offer flexibility to the architect, designer or homeowner like no other material with its expansive color palette, sustainable properties, timeless patterns and distinct beauty. The stunning Alcala cement tile pattern (pictured above) is a wonderful example of how a custom colorway created an eye-catching floor using warm colors and earth tones. 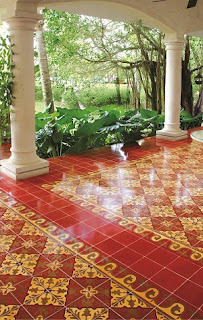 Cement tiles are often called Cuban tiles because of their ubiquitous use in both residential and commercial applications on the island of Cuba when it was a tropical playground. 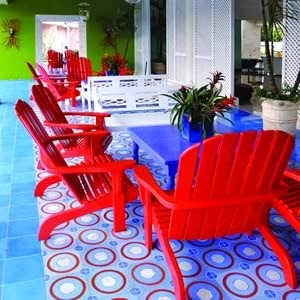 Cuban tiles patterns are generally more elaborate and often use bold, strong colors. The cement tile pattern used here, Cuban Heritage Design 160 2A, runs to the edge of the room (without a border) to create a contemporary feel. Did you know that each cement tile is handmade by expert craftsmen who use a process developed over a century ago? Other than slight changes being made to the materials and tools over the years, the manufacturing process remains the same. Handmade cement tiles start as a mixture of natural materials including crushed limestone, Portland cement, aggregate (small stones), sand, and water. 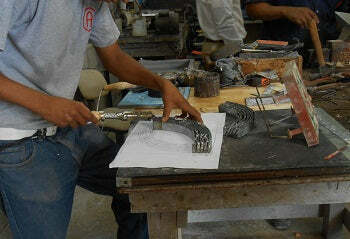 Up to 25 artisans handle each tile during the manufacturing process. Some hydraulically press the tile, others rack the tile before it is submerged in a water bath for 24 hours, and a few will layer and pour the mineral pigment in metal molds before it is set out to air-dry for about two weeks. That’s why each and every tile will have its own characteristics. The bold palette used on the walls and accent areas is seamlessly repeated in the eye-catching Sosua Cement Tile floor pattern. Handmade cement tile floors are the perfect complement to any room. In the example above, the bold palette used on the walls and accent areas is seamlessly repeated in the eye-catching Sosua Cement Tile floor pattern. Further, the versatility of cement tile as a building material shouldn't be restricted to solely indoor walls applications. You can transfer the same rich and silky feeling of cement tile to the outdoors where you and your guests experience a new environment. However, although cement tile can be used outdoors, it cannot be used in frost-prone environments. Dominican artist Cándido Bidó is the creative force behind the bold Espiral cement tile design used on this open-air patio floor. 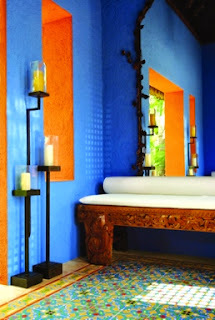 Similarly, Moroccan design and its various styling elements have always enjoyed great popularity. The same can also be said of Moroccan cement tile patterns with their playful geometric patterns that work well in both contemporary and traditional environments. Fez, the Moroccan cement tile pattern pictured here, offers a playful geometrics that work well in both contemporary and traditional environments. It should also be noted that cement tile shouldn't be restricted to residential use. With their inherit qualities of strength and longevity, cement tiles provide a sophisticated and grand entrance for any high-traffic or hospitality type environment. 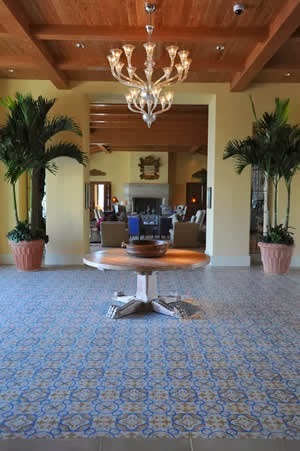 San Tropez cement tile pattern, used in this resort's lobby, features a color pallet that includes blue, mustard, white and gray. 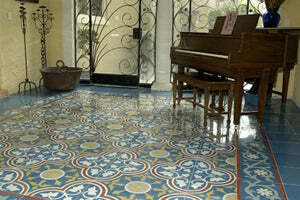 In regards to installation, cement tiles can be installed on wooden sub-floors. For residential flooring applications, it’s recommended you install cement tiles on a backerboard with a 1/2" plywood sub-floor above the floor boards. As for maintenance, cement tiles should be regularly mopped with clear water. A capful of liquid wax may be added to the water to improve the tiles' natural sheen. Also, never use acids to clean the tiles as they will sustain damage. Avente Tile’s handmade cement tile FAQs will help answer most, if not all, your questions. 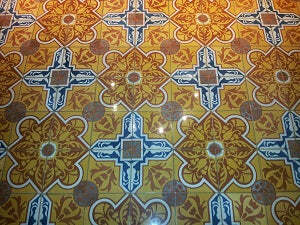 Are you ready to start planning your cement tile project? 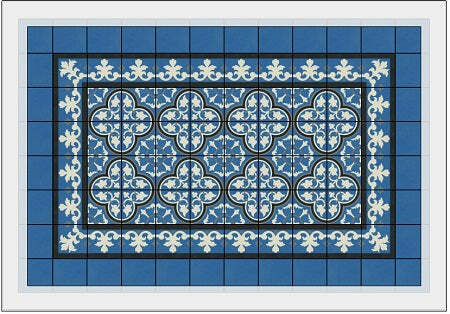 Then make sure to view the dozens of possibilities within Avente’s Cement Tile Design Ideas portfolio pages. For more than a decade, our company has been dedicated to providing cement tile products that are at the forefront of their class. At Avente Tile, we know that continually finding unique cement tile products and offering them at a great value ensures not only our success, but they must also meet or exceed your design goals. We are so dedicated to this philosophy that even our namesake, Avente, is derived from the Latin word abante, which means "before" or "at the forefront." As Autumn rolls in, we're taking time to reflect on how proud and honored we are to offer handmade cement tiles created by true artisans. Our goal is to offer products that meet your uncompromising standards. We believe the art of tile should be enjoyed by everyone, and should make your home warm, inviting, and unique. With an extensive portfolio of design ideas, we'll help you envision how cement tile can be used on floors, walls, ceilings, and backsplashes. Because of their natural slip-resistant qualities and versatility, cement tiles are perfect for bathrooms, kitchens, outdoor patios, fireplaces, and as cement tile rugs. 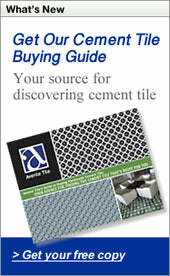 Lastly, we're very happy to announce that our Cement Tile Buying Guide is near completion! This Guide will serve not only as inspiration, but also as a reference source that addresses everything you need to know about cement tile, before, during and after purchase! Our commitment to you is the continued quest for excellence. So, how can we help you with your cement tile needs today? Our Pinterest board selection for this month is inspired not only by seasonal changes, but also the changes in flooring and wall décor we all look forward to conquering. With subtle breezes whipping through trees, combined with warm, Autumnal tones, we're sure our Rustic Paver Cement Tile collection will provide the look and feel of a charming Mediterranean villa to greet your guests and family with in the upcoming holiday season. Inspired? Then visit our pages on houzz.com, our boards on Pinterest, and browse through dozens of our Ceramic Tile Design Ideas portfolio page where you can find a large collection of projects showcasing our handmade and hand-painted ceramic tile, cement tile, decorative tile, mosaic tile, and so much more. Let us know how we at Avente Tile can assist you! You've been looking at cement tile patterns for months, debated color schemes and palettes, considered custom cement tile options and now are ready to order the tile! STOP! Before you place your order, first decide how the tile will be installed, and make sure to measure twice, or even thrice! There is nothing worse than waiting eight weeks for your tile and find out you didn't order enough! But don't despair, our handy cement tile layout guide can work as a checklist so you can ask all the right questions and find the answers you need in no time. 1. Framed or Rug design uses a border and plain tile to frame the main field pattern. Achieve the classic look of a tile rug on your floor with a border. The border cement tiles should frame the patterned field tiles and provide interest without distracting your eye from the main field pattern. 2. Full pattern repeat is where the pattern runs to the edge of the room or space and isn't framed with other tile patterns. This works great for irregular-shaped rooms or for a slightly more contemporary look. 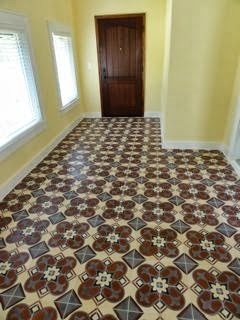 Cuban tiles in this entryway are run to the edge of the room for a full pattern repeat. When laying patterned or plain tile for a backsplash or floor, you want to minimize cuts in the main field. This means cuts to the tile should be only around the edges and the pattern should be centered in the space to captivate your senses. For floors, you'll start in the center of the room and work your way out to the walls; making cuts only to those tiles near the edge of the room. For a backsplash, you can achieve this by, by starting the pattern at the vertical centerline and working up from the counter or baseboard. Here's a recent layout I provided to a customer for their backsplash. The customer provided a scaled drawing of the area above their counter and behind the stove. The grey area is their backsplash and shows what they want tiled with cement tiles. The pattern starts at the counter and works up. The cut tiles on the vertical runs are close to the same width on both sides. Rug layouts are the most difficult, so start with a scale drawing of the area to be tiled. Find the center of the room and start your pattern for the main field in the center, too. Working out to include the border at least one tile width away from any irregular shapes or walls. Avoid cutting tiles for any reason that are inside the rug. For a quick way to determine the number of tiles required and the approximate rugs sizes, I recommend creating a scaled grid that overlays the area to be tiled. It allows you to easily sketch out the rug and move it until you are pleased with the layout. It’s a great way to estimate the tiles and determine the size of the rug. You'll need to determine the rug dimensions in order to calculate the required border tiles. 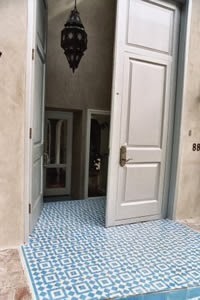 Cement Tile Rug used for Entry. In this recent customer layout, using a grid overlay, we could quickly center the rug for each area and then resize to make sure we didn't get too close to an edge, as well as account for irregular shapes, and have a full repeating quarter design pattern. Remember, DO NOT run the border right to the edge of the room. Leave at least 3- to 4-inches between the outside border and edge of the room for a plain, solid color "fill tile." Room edges are never square and cuts to the border will emphasize this, thereby guaranteeing an unprofessional or undesirable result. Cuts that are not true or square won't show on a plain tile because there is no pattern. 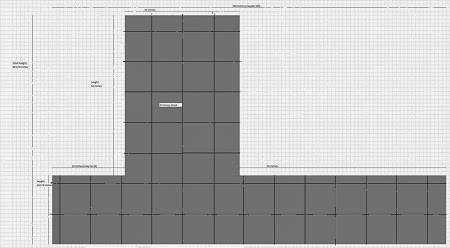 This grid overlay method works well for estimating tile quantities and approximate rug size; but, it’s still a good idea to have a detailed layout drawing or finished floor schedule. In fact, a detailed layout drawing will provide the best idea of look, point out any flaws with the layout, and clearly communicate your desires to the installer. 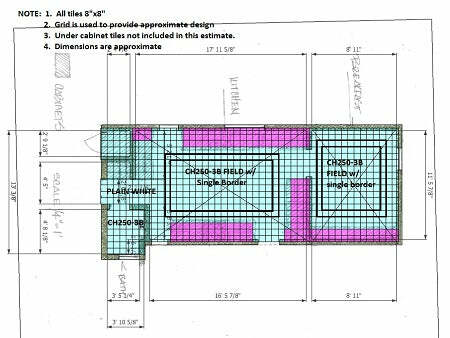 With a detailed drawing you can better visualize the space and you might be surprised what will work. For instance, in the design below, the customer decided that a full pattern repeat wasn't required for the short part of the L-shaped rug below. While I recommend keeping a full pattern repeat on most rug layouts, I love this layout and agree with the customer that it really works. The detailed drawing helped us find the balance between border, pattern and background it a tight and somewhat awkward space. These helpful resources will guide you to ask the right questions and find the correct answer regardless of the cement tile design and installation you choose. Cement tile rug with plain yellow tiles for the field. 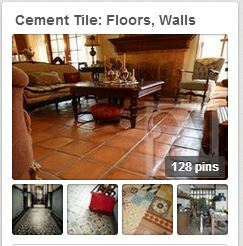 Let our passion for cement tile help you! With over a decade of experience selling cement tile, we care intensely about finding the right cement tile for you! 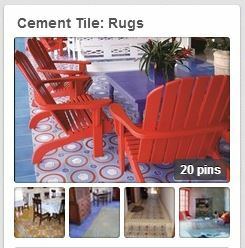 Visit our handmade cement tile information center, you 'll find links to resources that will answer all your questions about cement tiles. If you don t find answers, let us know by completing our Request Information form, or by calling us during business hours at 888.739.4972 9-5 PST M-F. We look forward to talking cement tile with you.